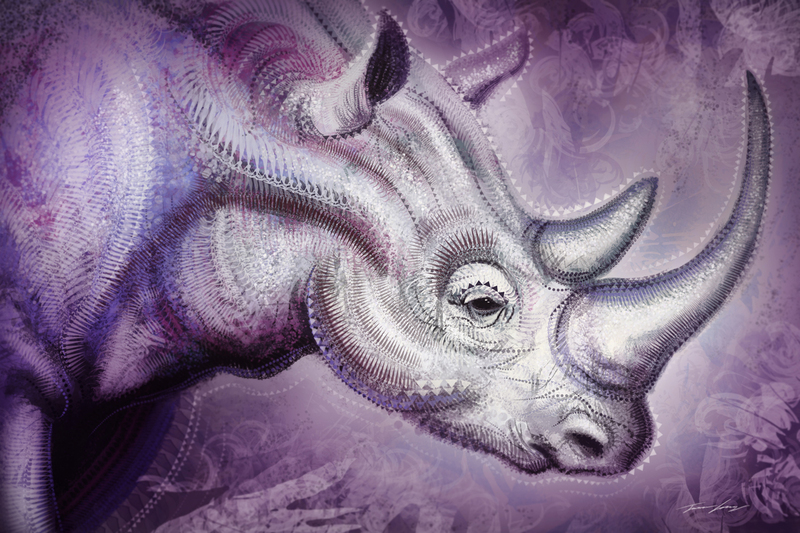 Concept Art and Design of Travis Lacey - Ravenseye Studios: The Great White Rhinoceros. One of the few remaining sub species that isn't endangered. In 5th grade we were tasked with a year assignment to do 50+ reports on a topic. I loving animals and at such a young age not realizing that an endangered species meant being exterminated not exotic. Chose to do my reports on endangered animals. I at a very early age was exposed to the horrors of the black market trade for parts of animals. The wrath our species brings to the other creatures of our planet. Sadly the Rhino happens to be one of those creatures that is highly in demand in the black market trades. Earlier this year the black rhino was believed to have gone extinct. It awoken the feelings of first seeing the images of men gathered around animals corpses. Bone hacked and being carried away from a grizzly murder scene. As an artist I am not unaccustomed to the tragedy of our existence. Yet I prefer to pay tribute to its aww and wonder. This time I celebrate the great white Rhino. May you reign exceed our species selfish kindergarten sand fight. May we one day grow to exist on this planet without harming your kind any longer.